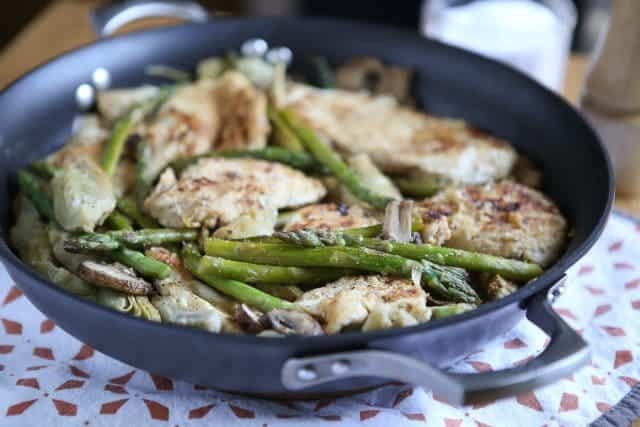 This Lemon Pepper Chicken with Artichokes, Mushrooms and Asparagus has everything you are looking for in a weeknight meal – quick, healthy and it’s cooked all in one-pan! This is an old recipe of mine that was a stand by in our dinner rotation for the longest time (originally posted in February of 2009!). I love looking back and seeing what we used to eat as a family on a regular basis. 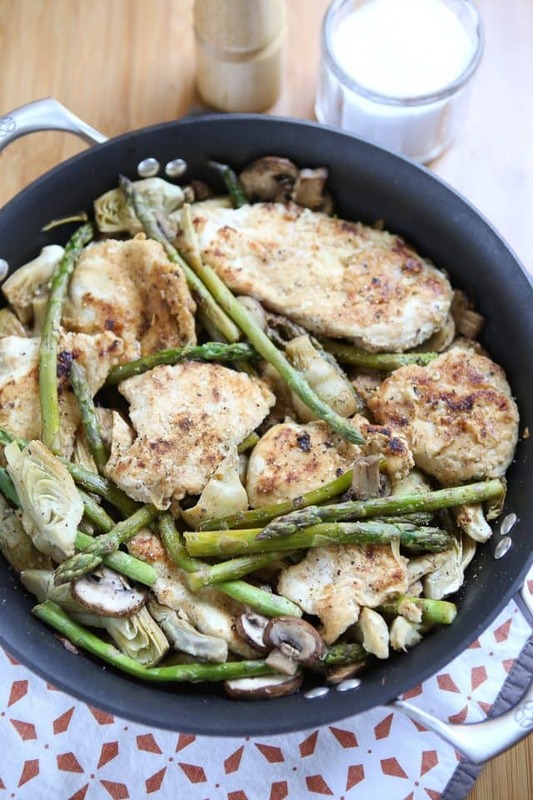 This Lemon Pepper Chicken with Artichokes, Mushrooms and Asparagus has made a reappearance lately and you may see more variations of it (using different vegetables) again. 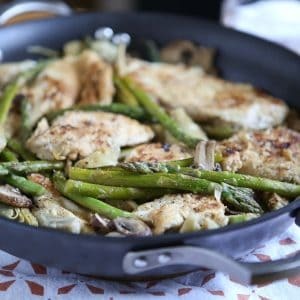 In case you haven’t noticed, I’ve been on a huge skillet and one-pan meal kick (especially since recently buying this nonstick everyday pan <– affiliate link). It’s honestly revived my whole dinner making motivation, if I can cook it all up in one skillet then I’m all over it. There are lots of fresh veggies in this dish, which makes me incredibly happy. I’ve been trying to really up the veggies lately (for the whole family). It isn’t normally hard for us to get in the veggies, but busy schedules and a touch of lazy can definitely interfere with the effort. So the more veggies I can get into a meal the better. It feels like an odd time to be using asparagus in a recipe, but my grocery store had some on sale. If you don’t want to use asparagus this time, try some sliced red bell pepper instead. The sauce is very light, and surprisingly very low in the calorie department. I use chicken stock and lemon to keep it on the light side, but you can definitely use some white wine in place of the chicken stock. I add a tablespoon of butter at the end to add a little richness to the sauce. Make sure to drizzle some of that sauce at the bottom of the pan over the top of your chicken when serving. In a large shallow plate mix together flour, lemon pepper seasoning and garlic powder. Add salt if your lemon pepper is a low salt version. Pour 1 tablespoon olive oil in a hot non stick skillet over medium high heat. Dredge chicken cutlets into flour mixture, shake off excess flour, and carefully place into hot skillet. Brown chicken for approximately 4-5 minutes on each side. Season with extra fresh ground pepper if desired. Once chicken is browned, take out of pan and place on plate. 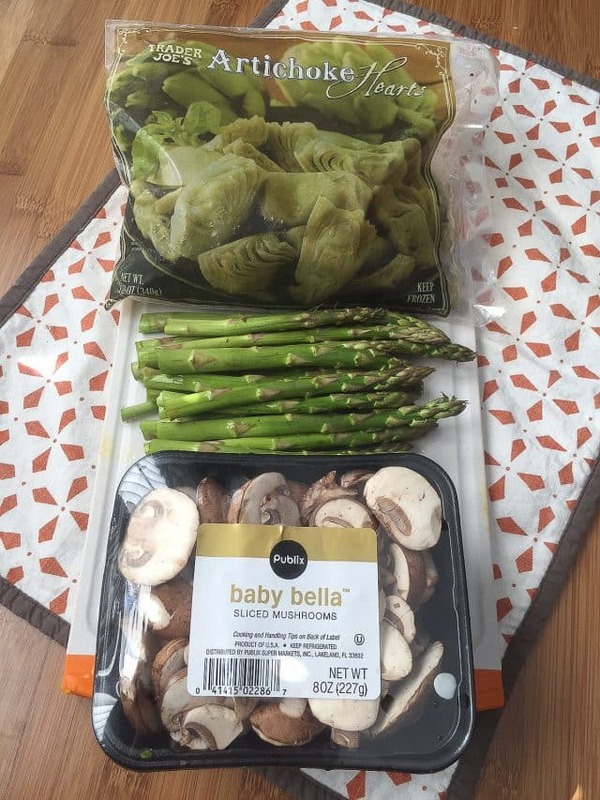 Add mushrooms and asparagus into skillet and start to saute. Season with coarse salt and fresh ground pepper to taste. Cook vegetables for about 3-5 minutes, or until mushrooms start to brown and soften. Add artichoke hearts, lemon juice and chicken stock. Place chicken back into pan and let everything cook together, gently stirring sauce over chicken. Cook uncovered over medium low heat for approximately 8-10 minutes. Sauce will thicken only slightly. Add butter at the end of the cooking process and gently toss. To serve, spoon additional sauce over chicken and vegetables. Hey girl – I have a couple of awards for you if you can stop by my blog and pick them up! You are the best!! Great go to meal. Truly. YUM! I am a HUGE fan of light easy meals. This one rocks. Did you guys have a good Valentine’s day?? I have some spinach in the fridge that I need to use. I’ll have to give this a try. It looks so yummy! Nice healthy meal!! The more veggies the better! I am sure spinach would be fantastic as well! Hope you had a nice weekend! This seriously looks so good. And I just so happen to have some leftover brown rice in the fridge. I love my electric skillet. I think I use it more than anything else. That looks fantastic! I love lemon and asparagus. I’m intrigued by yogurt butter, what’s the deal? I’ve never seen it before. Lot’s of good flavors together. Must be really good. This looks so great! All the ingredients are my favorite! This sounds really delicious! I love all the ingredients, so I’ll definitely have to copy the recipe and give it a try. The dish looks amazing Aggie! Hope you had a fabulous V-Day! Yippee! That dish just allowed me to finish my menu planning for next week – low carb-ish style! Oooh Aggie, this looks wonderful and all my favorite flavors!! Aggie looks great can’t wait to try and healthy to beat. Now this is my kind of dinner. I love every ingredient used. Great meal Aggie. I love recipes like these are they are so full of flavor. The chicken looks delicious, all golden and buttery! Yum!!! We adore asparagus! Everything looks deliscious as always!! This looks awesome, Aggie. I haven’t made a good lemon pepper chicken in a while. This will definitely appear on our menu soon! I am making this as my next chicken dish. This looks so good! Your recipe sounds perfect for a good weeknight (or weekend) meal. I love artichokes and the fact that you used canned ones makes it even more appealing. The last thing I want is the fiddly task of prepping artichokes. Lemon, garlic, mushrooms… perfect! I would love this meal. It’s so full of flavor; it has all of my favorites and it looks beautiful to boot! I made this last night dinner and it was great but made with the following changes, used green beans (hubby doesn't eat asparagas) & quartered mushrooms since I am the only one that eats them. Added a splash of wine to broth, some finely minced garlic, and cornstarch to thicken the sauce. Thanks for the recipe.. I made this for dinner last night! SO GOOD! I switched it up a bit (smaller servings for fewer people; no asparagus; no flour, etc.) but it was FABULOUS and will become a staple in our house! I linked back to your blog – everyone needs access to your yummy creations!